The new Kerrang! Magazine features a double page lead news story on Enter Shikari‘s forthcoming album ‘A Flash Flood of Colour’. There’s also a FFAF live preview & The Wonder Years and letlive. weigh in on video games. This week’s NME Magazine features a triple page extravaganza on the ins and outs of Enter Shikari‘s current UK headline tour with letlive. in support. Get the inside info on one of the live events of the year. Enter Shikari & letlive. get full marks! The new issue of Kerrang! features a 5K double page lead live review from Enter Shikari‘s headline show in Oxford last week which also includes a write-up of letlive.‘s rip-roaring opening set. 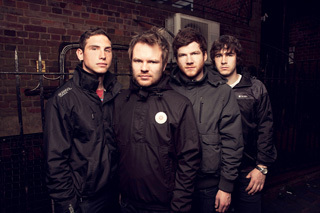 The mag call Shikari “immovable in their power”. NME.com is making us all feel old by turning 15 years old (already)! Jason from letlive. and Matt from Funeral For A Friend have each contributed their Top 10 albums of the past 15 years in a celebratory birthday feature here. The Wonder Years are Kerrang!‘s favourite album of the week in the new issue. The band score a lead review and a five out of five! “Pop-punk perfection.” Yes, we think so too. In anticipation of their co-headline UK dates with Saves The Day at the end of November, Ryan Key from Yellowcard has shared some of his Six Feet Under-related musings with Virgin.com. Check out the unique blog here. &U&I Music Vid Exclusive on Kerrang! &U&I have unveiled their new music video exclusively thgouh Kerrang.com and you can check it out here. The band’s debut album Light Bearer will be released on 21st November.